This recipe is super simple and versatile. 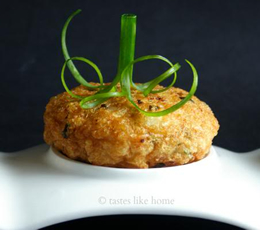 Tasty little crab cake alternative! The ingredient amounts are either vague or left out intentionally, as the recipe is very versatile. Experiment! You can contact Cynthia at tasteslikehome.org for an exact recipe if you wish. Rinse, drain well and pat dry shrimp. Pulse together the shrimp and ginger-garlic-pepper paste to a coarse texture. Transfer mixture to a bowl, add the remaining ingredients and mix well to incorporate. Use your desired frying method…just make sure they’re cooked through!